July 7, 2011 (Philadelphia, PA) Written by Robert Sutton. Its ingredients are unknown, but its effects are sensational. Where Ray Ferretti learned how to brew Leaf Juice is an unsolved mystery. Actually, there really is no question because, as an elixir, Leaf Juice does not exist. Rather, it's the enigmatic title of Ferretti's newest album. Nevertheless, listening to Leaf Juice provides a high of its own, an internal and healthy one; it's a record that awakens and stimulates the senses, an amalgam of progressive rock, jazz, and funk that exists in a universe all its own. In Ferretti's world, there are no boundaries that separate musical genres; they can freely stray into each other's acres of land. It's an attitude that Ferretti adopted because of his varied inspirations as a guitarist. "Guitar influences are like a family tree," Ferretti explained. "One leads to another which could cross genres as in the case of Carlos Santana and John McLaughlin. McLaughlin opened my ears to a jazz/rock fusion style which became my new drug. I was hearing chords and harmonies that did not exist in rock, and I was fascinated." Ferretti's interest in the guitar began in his youth. "I started playing guitar in my early teens," Ferretti recalled. 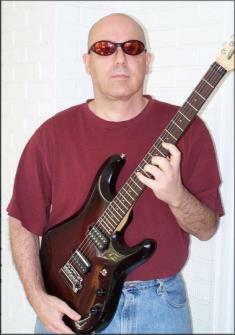 "I picked up a really cheap acoustic guitar and took lessons from the local guitar instructor. My teacher at the time stressed the importance of learning how to read music. Guitar tabs did not exist back then so you had two choices - learn to read or play by ear. Ear training is very important but learning how to read opened up a lot of doors later in life for me doing session work and the other types of gigs that require you to read music." A lifetime's worth of musical education and experience are the real building blocks behind Leaf Juice; however, all of that must be filtered through an open mind. "Besides the guitar studies I mentioned earlier listening to all types of music has been the greatest education of all," Ferretti observed. "One day I was at Pat Martino's house, in his room where he gave his lessons, and I was looking at his large album collection all over the floor. I came across an Earth, Wind & Fire album. I asked him ‘you listen to Earth, Wind & Fire?' and he replied something like, ‘Take the best and leave the rest,' which meant take anything from any style of music that interests you, learn it, and make it part of your style."